1 bedroom, 1 bathroom, living area, mechanical room and 6′ porch. 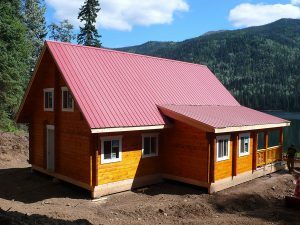 Log frame: Consisting of 3”x 6” tongue & grove (t&g) logs with saddle notch connections, ridge beam, timber truss with posts and jacks, inside wall in 3” x 6” logs and special log screws to secure logs. Roof system (recreational, without building permit): Consisting of 2”x 8” precut rafters, fascia boards, trim, sheet metal roofing, R-22 fiberglass insulation, 3/8” plywood as inside sealing, vapor barrier, tarpaper and miscellaneous screws and nails. Other R-values are available upon request. Option: A storage loft with ladder.